I am an artist and I work as a project manager at Edinborg cultural center in Ísafjörður. I have been working with a group of young people in Westfjords on a art festival for young people called LÚR-Festival this has been really fun and creative process. I have for the last few years exhibit my art work in Iceland and the Nordic countries. I'm a 17 year old student at Menntaskólinn á Ísafirði (college). I live in a small town in Iceland called Bolungarvik. I'm the chairman of the youth council in my town which focuses on making Bolungarvík a better place for young people. I have also been working with a group of young people in Westfjords, Iceland on an art festival for young people called LÚR-Festival. I'm a 17 year old student at Menntaskólinn á Ísafirði. I live in a small town on Westfjords in Iceland called Þingeyri. 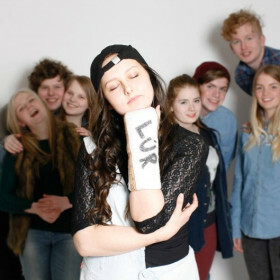 I have been working with a group on an art festival for young people called LÚR-Festival in Iceland.